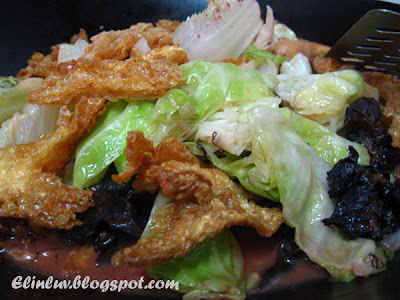 The preparation takes a lot of time...washing the chinese cabbage and cutting them into 1.5" lengths, soak the transparent vermicelli and the 'fatt choy' ( black seaweed ) till soft , deep fry the dried beancurd and etc etc. but whatever it is, it is always worth the effort for this dish turned out great. 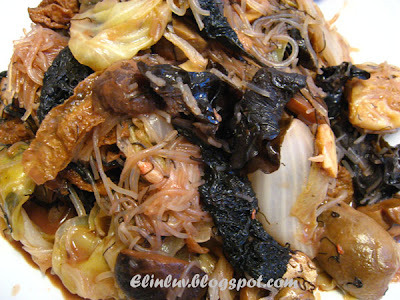 The chinese has this custom to cook this dish on the 1st day of Chinese New Year....don't ask me why..I really don't know why but my beloved mom used to cook this when she was around. Hmmm I miss her cooking very much. I managed to pick up her recipe ( of course mine doesn't taste as good as hers ) and thus continue the custom every year though I am a Christian. Not so much as the custom or what it symbolizes of but so used to having it on the first day of the Chinese New Year LOL! Cut the cabbage into 1.5" length. 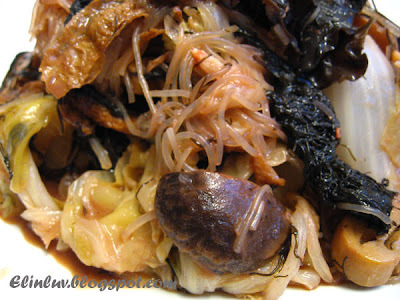 Cut the soaked mushrooms and button mushroom into halves. Soak glass and black seaweed ( fatt choy). Deep fry the beancurd stick in enough oil till lightly brown. Dish up and keep the oil for further use. I will have to start cooking and baking new stuff ! Mmm...this is my favourite. 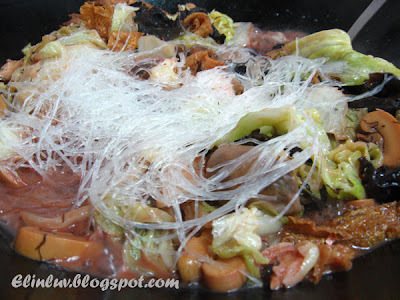 We called this luo han zhai(罗汉斋)and I always add more sauce to cook this...so delicious! I like this dish too, so tasty! 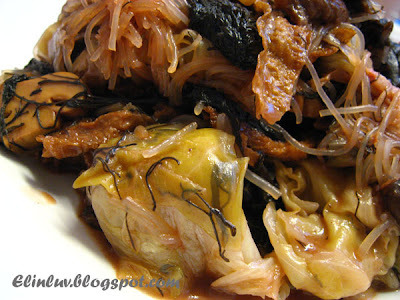 Love Chinese cabbage, it soaks up all the yummy sauce. It is my favourite dish all the time, coz it has 南乳! I just finished my 'jai choy' 2 days ago. Used to cook it on the first day, so rush, now I do it on the eve, and keep in the fridge and freeze any extra. U are a good mom, willing to cook any dish upon ur's kids request. I like ur dish, me also cooked the similiar dish days ago, not as nice as urs as i'm not a good cook. I like this vegetarian dish too. We call it Chap Chye. Thank you for this recipe.. happy! !